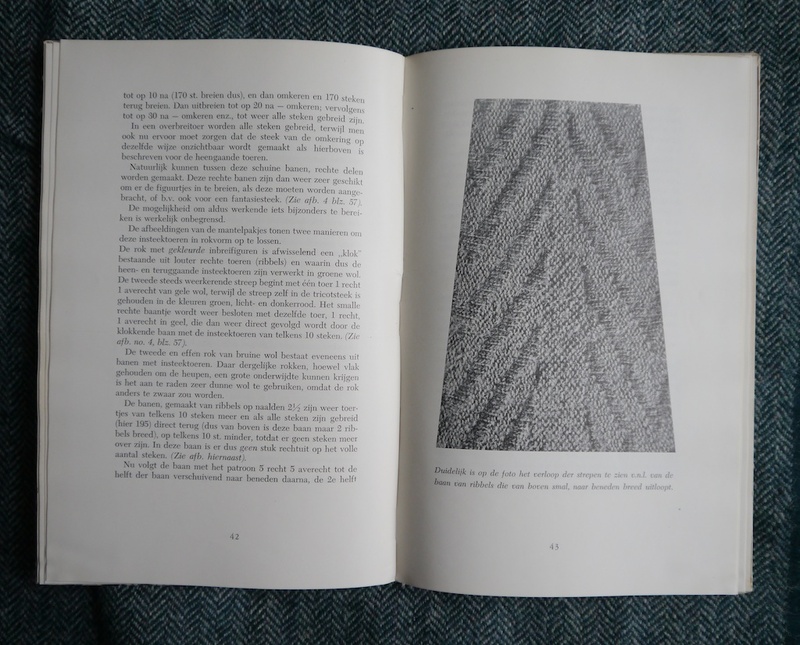 When I visited the Fries Museum earlier this year, their textile conservator, Gieneke Arnolli, showed me an old Dutch knitting book that I just couldn’t get out of my head. I felt it would be an indispensable addition to my knitting library, but it took me a while to find a copy of this book. 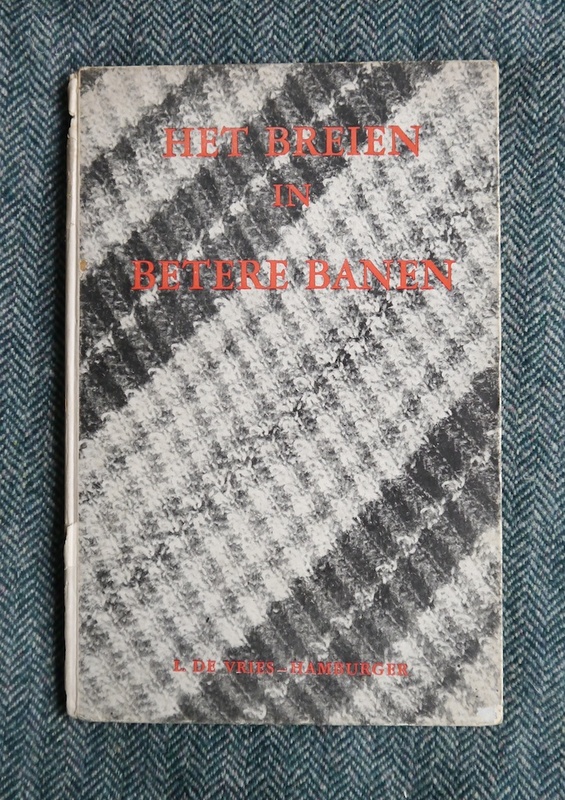 Het Breien in Betere Banen, which I think translates best into A Better Course in Knitting was written by L De Vries-Hamburger and published in 1949 by DA Daamen’s Uitgeversmaatschappij n.v., ‘s-Gravenhage, The Netherlands (you may know ‘s-Gravenhage better as Den Haag.) So far I have not been able to learn much about De Vries-Hamburger. From the introduction I know she taught knitting after the Second World War, and she wrote this book as result of many requests by her students. Is it necessary that another new item is added to the reams of existing ones and is the publication justified? Those that speak thus expect a knitting book, preferably brimful with new patterns. This book, although it deals with knitting, is not that book. She feels that every girl and woman is capable of creating unique garments, and following knitting patterns to the letter can never be fully satisfactory. Handicrafts can be much more than that! This book aims to point out possibilities and make knitters more confident in their own abilities. So, this book then doesn’t give you any knitting patterns, but plenty of hints and tips on how to approach the knitting of garments. De Vries-Hamburger is a fan of knitting from the top, as she feels it’s easier to try on works in progress on and ensure a good fit. When knitting from the top is not desirable for whatever reason, she advocates knitting the ribbing last. 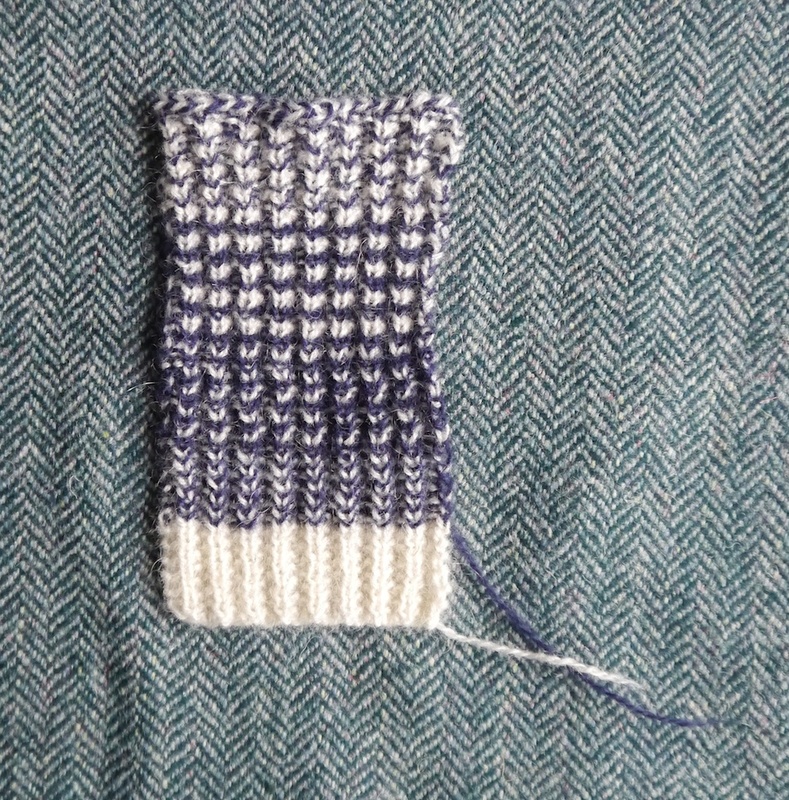 The knitting starts with the main part of the body or sleeve. These then get blocked and sewn up, and the ribbing is knitted in the round from the cast-on edge down. This way it’s easier to adjust length, or replace fraying cuffs and welts. 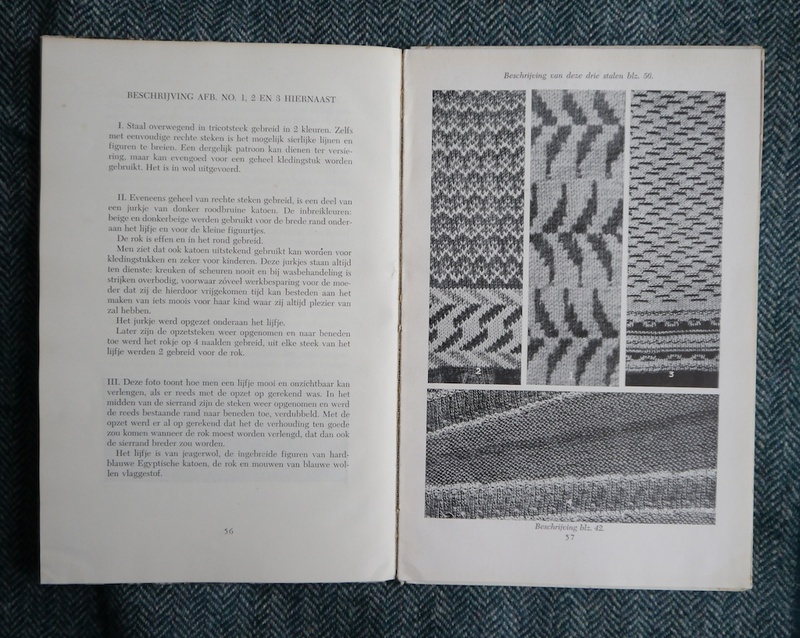 This book was written not long after the Second World War, and in one section where this becomes apparent is on how to create colourful fabrics without resorting to stranded colourwork. Yes, stranded colourwork is good way of using up odds and ends, but she points out that by playing around with mistake rib (cast on an ODD number of stitches, then K2, P2 to end (you’ll end with 1 knit or 1 purl); turn work, and again K2, P2 to end (again you’ll end with 1 knit or 1 purl) and using more than one colour can be even more economical. The purls on top of knits in different colours create pleasing tweed effects. By using double-pointed needles it is possible to knit the right side of the fabric more than once, by sliding it back to the other side of the needle once a row is knitted. This way it’s possible to knit odd numbered repeats. 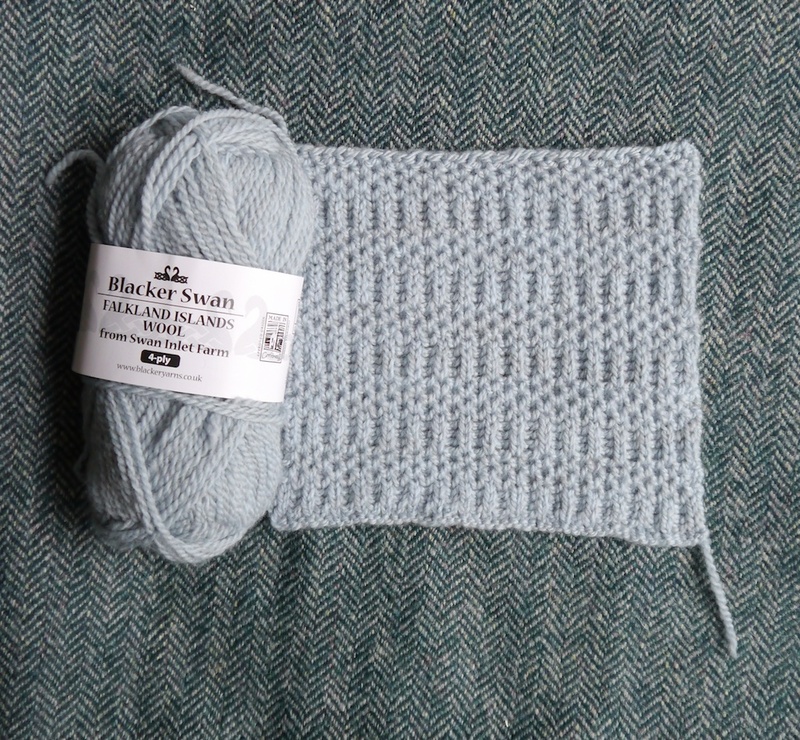 For instance in the little swatch above, in the top section I knitted two rows in white, and one in blue. However, De Vries-Hamburger also likes to play with colour in a more traditional way and has lots of lovely examples of stranded colourwork. 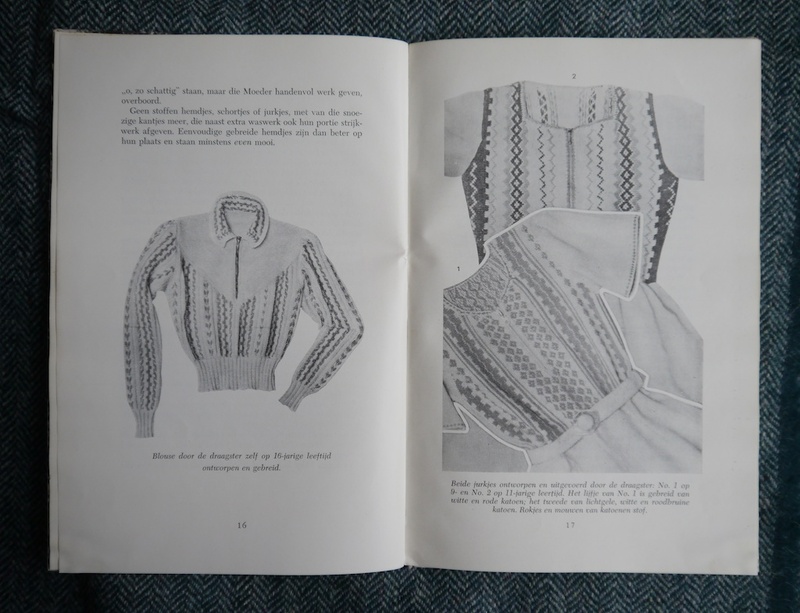 She even devotes a whole section on sideways knitting (knitting from side seam to side seam instead of knitting from top to bottom or vice versa,) and how a few simple stranded colourwork rows can look very sophisticated when used this way, such as the blouses shown in the second picture. I feel that De Vries-Hamburger really understands knitting and the qualities of knitted fabric. She is very clear on why knitting is a unique way of creating fabric, as it is possible to shape it whilst you create it. Compare this to sewing, where one uses a piece of cloth, which needs to be cut to make the shaping. With this in mind, she believes that a knitter should start by asking: what kind of fabric do I need to make this item fit for purpose, and once this is determined, start looking what yarns and stitches will lead to the desired effect. This in contrast to what often happens: a knitter has some pretty yarn and a stitch dictionary, and then tries to find a garment to which these can be applied. As has been made clear to the knitter and reader in the introduction, this book does not contain a single knitting pattern. However, it is full of inspirational pictures, which De Vries-Hamburger hopes will be a starting point on an exciting creative journey for the intrepid knitter. Reading this book, which was written in 1949, I came across many prescient ideas that resonate with latter-day knitters who probably have never heard of De Vries-Hamburger. To name a few: Barbara Walker advocates knitting from the top in order to create well-fitting garments. The inimitable and opinionated Elizabeth Zimmermann also wanted to free knitters from the yoke of the knitting pattern and preferred to give knitters “recipes” in which they can plug in their own ideas. 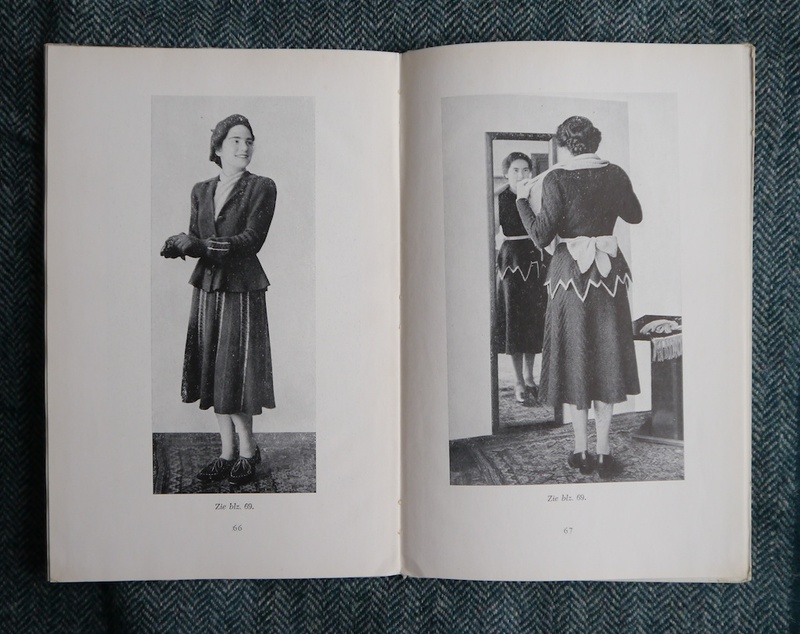 And even finding links to the 21st Century is not difficult: Amy Twigger-Holroyd‘s PhD research on home-made fashion, sustainability, and design is partly based on the believe in the inate creativity of knitters to design and adapt their own clothes – something she calls Folk Fashion. So, why did I decide to use a herringbone tweed fabric as a backdrop for my pictures? 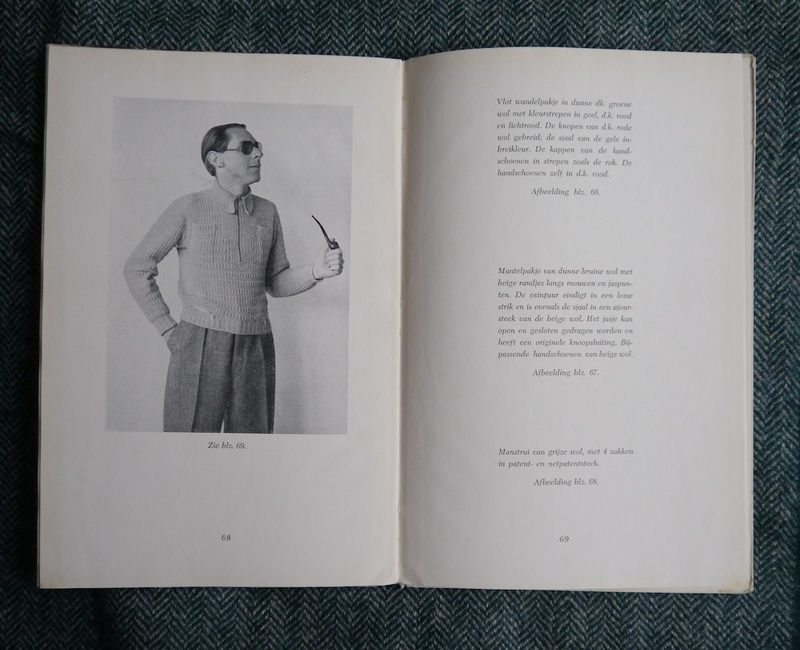 I was smitten by the only men’s garment in this book. It is knitted in alternating stripes of brioche rib, and honeycomb brioche (if you want to know more about brioche stitches, then look no further than Nancy Marchant; what she doesn’t know about brioche stitch is not worth knowing.) As you may have gathered, there is no pattern for this jumper, and I have done a lot of swatching to arrive at the right fabric. I also happen to have a length of herringbone tweed I purchased from Jamieson’s of Shetland during Shetland Wool Week last week. Taking a leaf out of De Vries-Hamburger’s book so to speak, I started with thinking about the fabric I wanted to make for this jumper, and then started to look for an appropriate yarn. I ended up with a very surprising choice: Blacker Swan merino 4-ply. I’m usually not a fan of merino yarns. Yes, they’re soft, and yes, they take dye beautifully, but they seem to lack any character. I also have a notion (unsubstantiated at this point) that the merino fibres finding their way into hand-knitting yarns are often not the best quality that can be offered by merino sheep. I have more than once been disappointed in the amount of pilling that ensues after a few wears. On top of that merino is often treated to be superwash, which to my mind alters the handle of the yarn unfavourably. Blacker Swan seems to be different, and although this may be due to the fact it has some Shetland fibre mixed in, I’m more than willing to give merino a chance once more. I’m looking forward to cast on and start knitting, and use my long Christmas break to make a smashing pair of tweed trousers and keep you updated on my progress. And, of course, to let you know how I got on with my renewed interest in merino wool. What a handsome outfit! I can’t wait to see how it turns out! Fascinating looking book, I love how so many from this time encouraged knitters to do their own thing. Such a logical approach too, to knit the cuffs last for length adjustment and mending purposes. So many rules about how things are supposed to be done which aren’t always for the best – let’s mix it up! What a great book, so impressive re what those young women designed! Your swatch is super. Very clever. Tom, have you read Audrie Stratford’s ‘Introducing Knitting’, published in 1977? We have a lot of her stuff at the Knitting and Crochet Guild Collection, and in my next lifetime I’ll go through all her notes – wouldn’t surprise me if she was a fan of your ‘new’ book. Ruth Gilbert. Thanks so much for sharing the contents of this books. I’m going to try the “mistake rib” as I love the effect you’ve achieved. I also love the brioche swatch that you’ve made. Many great things to ponder here! I loved your review of this book thank you so much for sharing it with us. The concept of not knitting from a pattern is one that I have been toying with for a while now. Previously I have been one of those knitters! I find a pattern or yarn and replicate someone’s work. But recently after trying several sock patterns that didn’t work out I have made the plunge into creating a fabric that I create on my own. We’ll see how it goes! Can’t wait to see your tweed when it is completed. Thanks again for sharing such a detailed review of this book! Lovely post. Her approach put me in mind of Montse Stanley (and Barbara Walker who you mentioned). I’ve also found that some merino pills terribly but I’m not a spinner and didn’t know if it was to do with the fibres used or the method of spinning. I wish some of my grandchildren lived nearer – they would be a good size to practise self-designed garments on! Tom, this is soo familiar: is there a picture of a darkhaired young girl (teenager) posing against a parapet of a stone, semi circular balcony near the end of the book ? I am desperately looking for the book, I am am sure I have it, and the lady lived three doors up from us, in Wassenaar. My mother used to go to her ‘classes’ just after the war. Yup, found it, yes it was, she lived at 17 or 25 Duinlustweg, Wassenaar. Will try and dredge up some memories, thoug I was 6 at the time!